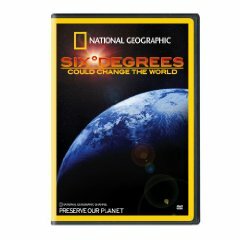 What does the film state about Global Warming at the beginning? Where are we at in this Six Degrees (Celsius) (~11oF) Global Temperature rise? What scenarios are predicted with each degree rise in Global Temperature? Polar bears struggle to survive as glaciers increasingly melt away. Glaciers in Greenland begin to disappear, while coral reefs are vanishing. The Amazon rainforest is drying out and El Niño’s intense weather pattern becomes the norm. Europe repeatedly experiences searing summer heat that has rarely happened before. Oceans could rise, taking over coastal cities. The disappearance of glaciers may deprive many of fresh water. Northern Canada’s agriculture could boom and a Scandinavian beach could be the next tourism hotspot. A part of Antarctica could collapse, causing water to rise even further. Uninhabitable zones could spread, snow pack and aquifers feeding big cities could dry up, and climate refugees could run in the millions. Human civilization could begin to break down with this drastic of changes to the climate. The poor would likely suffer the most. What are the current carbon dioxide levels and what is the critical point in parts per million? The McMurry textbook, p 462 Figure 16.3, states the current level (2011) is at 389 ppm. The film was produced in 2007, so has the CO2 level of the atmosphere increased or decreased in the last four years and by how much? See the web page pasted at the end of this handout. Why is the carbon dioxide level important to Global Warming? Trace the impact of a cheeseburger on Global warming. At the end of the film are suggestions of how YOU can make a difference in Carbon emissions, List as many as you can at the end of your paper with a pro/con comment.